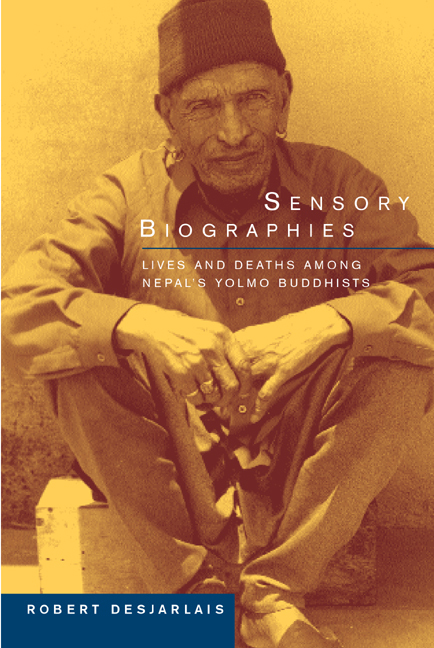 Robert Desjarlais's graceful ethnography explores the life histories of two Yolmo elders, focusing on how particular sensory orientations and modalities have contributed to the making and the telling of their lives. These two are a woman in her late eighties known as Kisang Omu and a Buddhist priest in his mid-eighties known as Ghang Lama, members of an ethnically Tibetan Buddhist people whose ancestors have lived for three centuries or so along the upper ridges of the Yolmo Valley in north central Nepal. It was clear through their many conversations that both individuals perceived themselves as nearing death, and both were quite willing to share their thoughts about death and dying. The difference between the two was remarkable, however, in that Ghang Lama's life had been dominated by motifs of vision, whereas Kisang Omu's accounts of her life largely involved a "theatre of voices." Desjarlais offers a fresh and readable inquiry into how people's ways of sensing the world contribute to how they live and how they recollect their lives.